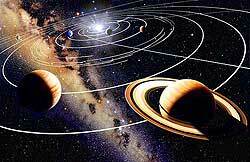 The solar system, likewise, orbits a center of our galaxy, the Milky Way. This galaxy consists of more than 130 billion stars. Galaxies, in turn, revolve round a center that only Almighty Allah knows. The law of revolution applies also to atoms, the smallest units of elements that cannot be seen even by microscopes. An atom is composed of a nucleus whose diameter is less than a millionth of a millimeter. An atom is surrounded by electrons that move round the atom in an orbit. Since all matter in the universe-whether solid, liquid, or gaseous consists of atoms, this means that the law of revolution applies to everything: stars, planets, moons, animals, plants, sand, seas, air, and so on. This includes cells as well. The cytoplasm in the cell moves around the nucleus. There is a common factor between the orbital movements of all the objects referred to above, this is, and their revolution is anti-clockwise. Contemplating the above lines, we come to realize that revolution is a cosmic law. With a believer's meditation upon such a scientific fact, another image of revolution is brought to one s mind: the pilgrim's circumambulation of the Kaaba, which is a basic ritual of Hajj in Islam. Circumambulating the Kaaba is a symbolic act of worship, whose wisdom may be hidden from some. It indicates the believer's utter submission to Almighty Allah alone. The pilgrims go to Hajj in response to the divine order that Prophet Ibrahim or Prophet Abraham (peace be upon him) conveyed to people. Allah Almighty says: "And (remember) when We showed Ibrahim the site of the (Sacred) House (the Kaaba at Makkah), saying: Ascribe not anything (in worship) with Me, and sanctify My House for those who circumambulate it, and those who stand up (for prayer), and those who bow (submit themselves with humility and obedience to Allah), and make prostration (in prayer). And proclaim to mankind the Hajj (pilgrimage). They will come to you on foot and on every lean camel, they will come from every deep and distant (wide) mountain highway (to perform Hajj)." (Al-Hajj, 22:26-27). This signifies that the Kaaba is the spiritual center of the believers. It refers to the close bond that should be between a believer and his Lord. A believer turns toward the Kaaba five times a day during the prescribed ritual Prayers. A pilgrim circumambulates the Kaaba as if he or she is a celestial body orbiting another greater body. Circumambulation of the Kaaba is to be performed anti-clockwise. This indicates that there is a joint factor between a pilgrim's expressing his ultimate faith in Almighty Allah by circumambulating the Kaaba in that way and between the cosmic laws of revolution discussed above. This indicates that there is consistency between the obligations of worship in Islam and the natural laws that govern the universe, which indicates that they all belong to only one source, that is, Almighty Allah. This proves the truthfulness of the call of Islam that there is no god but Almighty Allah. Thus, Islam is the true religion that provides humankind with a comprehensive view in conformity with the divine truth that is apparent in the natural laws of the universe. The planets circumambulate the sun, for they take everything from it. Inside an atom, the electrons circumambulate the protons. The whole universe ranging from the invisible particles to the planets and galaxies circumambulate. Man, being a part of the universe, should circumambulate, too, with the difference that the planets circumambulate in a compulsory way according to the laws of nature, but man, the rational being and possessor of free will, circumambulates with his logic and will a House God has appointed to honor human beings. Hence, it is natural for Muslims to offer their prayers, to sit, to stand, to recite the Holy Quran, to sleep, to lie down at the moment of death, to be put in grave, and finally to be in that direction during their lifetimes and death. The current height of the kaaba is 39 feet, 6 inches and total size comes to 627 square feet. The inside room of the kaaba is 13x9 meters. The kaaba's walls are one meter wide. The floor inside is 2.2 meters higher than the place where people perform Tawaf. This small building has been constructed and reconstructed by Prophets Adam, Ibrahim, Ismail and Muhammad (peace be upon them all). No other building has had this honor. Yet, not very much is known about the details of this small but significant building. Holy Kaaba: The House of Allah (SWT) in Makkah, Saudi Arabia. The Kaaba is covered by a black cloth known as 'Kiswa', which is produced and changed every year. Special factory designed for the making of Kiswa in Makkah. It costs approx. SR 17million.The cloth is made of 670kgs of Silver dyed black, about 120kgs of pure Gold and 50kgs of Silver used in writing the Qur'anic verses over the cloth. The total area of the cloth is 658sqr meter. 1. Baitul Ateeq - which means, according to one meaning, the earliest and ancient. According to the second meaning, it means independent and liberating. Both meanings could be taken. 2. Baitul Haram - the honorable house. Following this, there were several constructions before the Prophet Muhammad's (sallallahu alaiyhi wassallam) time. Prophet Muhammad (sallallahu alaiyhi wassallam) participated in one of its reconstructions before he announced a Prophet. After a flash flood, the kaaba was damaged and its walls cracked. It needed rebuilding. This responsibility was divided among the Quraish's four tribes. Prophet Muhammad (sallallahu alaiyhi wassallam) helped with this reconstruction. Once the walls were erected, it was time to place the Black Stone, (Hajar al-Aswad) on the eastern wall of the kaaba. Arguments erupted about who would have the honor of putting the Black Stone in its place. A fight was about to break out over the issue, when Abu Umayyah, Makkah's oldest man, proposed that the first man to enter the gate of the mosque the following morning would decide the matter. That man was the Prophet Muhammad (sallallahu alaiyhi wassallam). The Makkans were ecstatic. "This is the trustworthy one (Al-Ameen)" they shouted in a chorus. "This is Muhammad." He came to them and they asked him to decide on the matter. He agreed. Prophet Muhammad (sallallahu alaiyhi wassallam) proposed a solution that all agreed to - putting the Black Stone on a cloak, the elders of each of the clans held on to one edge of the cloak and carried the stone to its place. 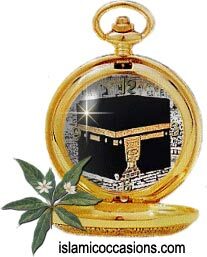 The Prophet Muhammad (sallallahu alaiyhi wassallam) then picked up the stone and placed it on the wall of kaaba.